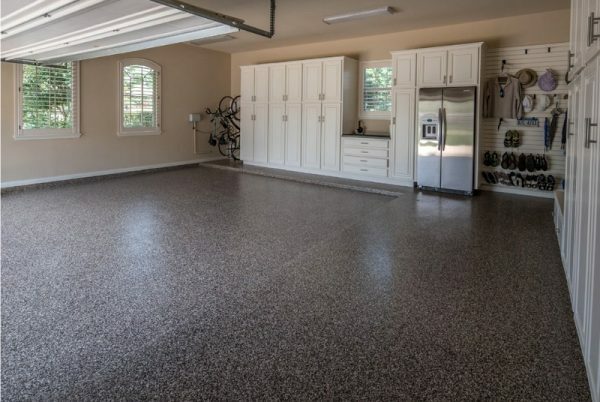 An epoxy flooring system is made up of two components, resin and a hardener. The resin component is usually light, sometimes almost clear colored and almost odor free. Hardeners are usually dark and have a characteristic ‘ammonia-like’ smell. When these two components are brought together and mixed intimately in a prescribed way, they will react chemically and link together irreversibly, and after the chemical reaction has been completed, they will form a rigid plastic material. The ultimate result is a firm, durable, protective, and beautiful flooring enhancement. Additionally, epoxy floor systems are available in wide array of base and chip colors to match any existing decor. enVision Epoxy can customize the color of your epoxy floor and floor chips to your choosing.